Grand Relax is a luxurious reclining lounge chair combining outstanding comfort with compact dimensions and a classic understated aesthetic. The chair offers an exceptional seating experience, which stems from the harmonious interplay of diverse elements and was conceived specifically for a leather upholstery. High-quality leather covers encase the soft seat and back cushions, which sit loosely on the lounge chair. They snugly envelop the user and yet always return to their original shape. When sitting down, the user sinks slowly into the cushions, while a concealed integrated mechanism absorbs the weight and moves the chair into a reclined position. The seat and backrest move independently in synchronised motion. A control knob can be rotated to adjust the resistance of the mechanism, and the backrest can be locked at any angle. Mounted on an elegant four-star base made of aluminium, the lounge chair can be rotated by 360°. A matching ottoman is available as a foot rest or additional seating option. Grand Relax features a combination of choice materials, such as cast aluminium and high-quality leather or fine fabrics. 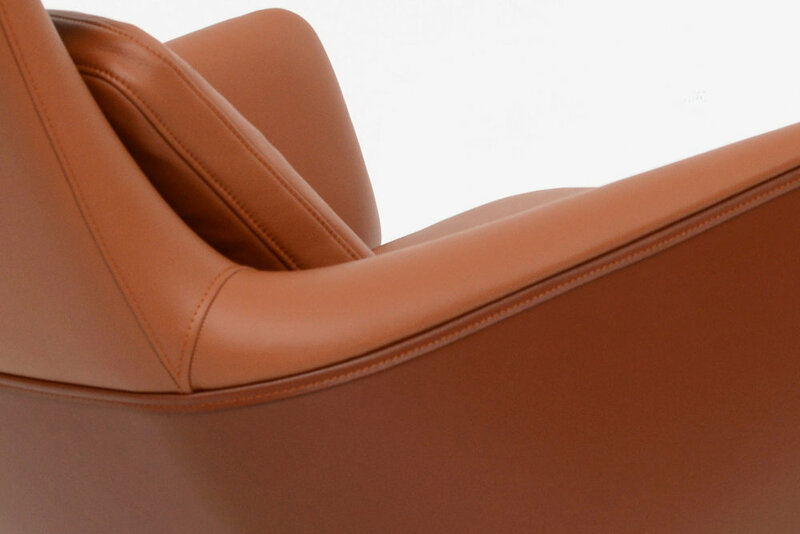 The lower half of the outer backrest shell is covered with embossed split leather, forming a type of shield that enfolds the user, while defining the contours of the lounge chair. The combination of split leather and Leather Premium creates a dynamic contrast between the armchair's inner and outer faces. Split leather is also used to cover the understructure of the seat and ottoman. Grand Relax has a compact yet inviting appearance. The carefully designed proportions of the low-slung body, long armrests and upward tapering backrest visually emphasise the dynamic seating experience and emanate a comfortable feeling of security. Newer PostAre textured wall coverings the new wallpaper?